I think the best theory is that her parents did sell her for drinking money, but the Force was imbued somehow in her, and she gained her powers. It's clear that her powers didn't really manifest until she got Luke's saber. Before that, it was mostly skill and luck. Why?! Why did you revive this incarnation of cringe?! I saw this, and had a theory. I like her being a nobody, it gets back to the spirit of Luke in episode 4, making it so that the movies have the message that you don't have to be tied to a long or fancy bloodline to be the hero. This is the only theory about Rey I'm actually OK with. I don't like any of the "Rey = X's daughter" theories, because their very philosophy makes things too "neat" by acting like everyone of importance must be related to a Legacy character (a.k.a. Finn Calrissian, which is just...really?). Plus, we already have a prominent descendant of the OT characters in Kylo, who is plenty. Rey being no one of importance, in reality rather than in appearance, aligns with the idea of Star Wars, which is that ordinary people can harness extraordinary power when necessary to maintain the balance of the Force. We know that the new canon has reintroduced the idea that Anakin was the product of a Sith meddling with the Force. In the EU, it was Darth Plagueis who "fathered" him, but the new, canon Vader comics seem to indicate that this has been switched to Darth Sidious himself, perhaps through knowledge he learned from Plagueis, who was known to experiment with the Force in order to "create life." I think it would be interesting if Rey is also a product of someone meddling with the Force, more specifically the Light Side of the Force. Who do I think it should be? Kylo. Ben Solo was around 10 years old when Rey was born, so this seems odd, but it seems likely that he was beginning to explore his Force sensitivity by that time. Luke tells Rey in TLJ that Kylo was the first time he had ever seen someone with as much raw strength as her, so for a 10 year-old boy, such power would obviously allow him to do things--even inadvertently--that he would not understand. My "theory" (a.k.a. idea) is that Ben Solo accidentally created Rey through the Force while messing around with his newfound powers, causing her to be conceived as the daughter of a junk trader on Jakku, who was presumably married to another such trader. This gives Rey's "parents" additional impetus to sell her--not only do they need drinking money, she is an unwanted child conceived through an apparent miracle that would probably disturb them both greatly. We see in Rey's vision that she was abandoned when she was young (maybe 4 or 5). My guess is that her "parents" finally chose to be rid of her after first encountering her Force sensitivity, which further freaked them out. 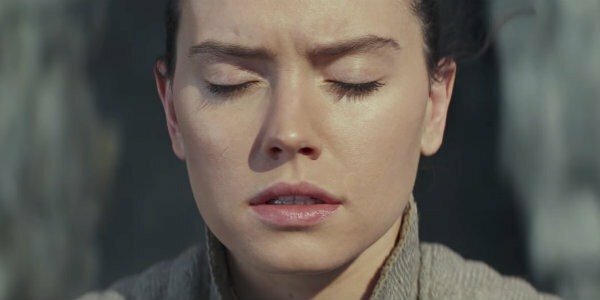 So, in this "theory," Kylo Ren is Rey's "father" through the Force, which explains their Force connection (and, in particular, why it seems to last beyond Snoke's death), as well as her strength; it also preserves both JJ's desire to have a dramatic twist for Rey and Rian Johnson's decision to make her a nobody. Its nearly impossible J. J. would keep that that dissapointing reveal. He had a plan, and that reveal was part of Rian Johnson's plan, which J. J. Has already expressed a dissapointment towards. which J. J. Has already expressed a dissapointment towards. There was no evidence or aorces to support your point as well. Not to mention not once did your article mention the Rey's parents reveal. There's also this. And a quoute from J. J. here. Do some research of your own before going and pulling the "yoU DiDn'T hAvE anY SoUrcEs" card. This is just an internet forum. People are going to say things without five peer reviewed articles to back up their claim. Just be less aggressive. You didn't initially post sources, both last and this Time you've posted about this, pardon me whilst I ask for some. People are going to say things without five peer reviewed articles to back up their claim. Just be less aggressive. 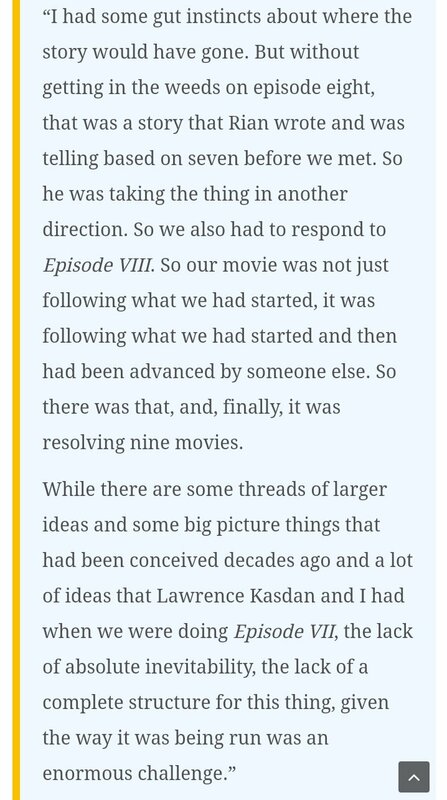 He had a plan, and that reveal was part of Rian Johnson's plan, which J. J. Has already expressed a dissapointment towards. You people just can't accept that The Last Jedi wasn't a very good movie and Rian Johnson doesn't know how to make a Star Wars movie. Also, if you actually bothered reading either of the articles you'd find that the second explains that J. J. Was unhappy with the direction it was taken in. I will also note not once have I seen either you or @TheOnlyGuyWhoLikesMistika post sources aside from the post he made to me asking for a source, so why dont you start applying your logic to yourself before you go around harassing people. It says nothing about being unhappy towards eight. 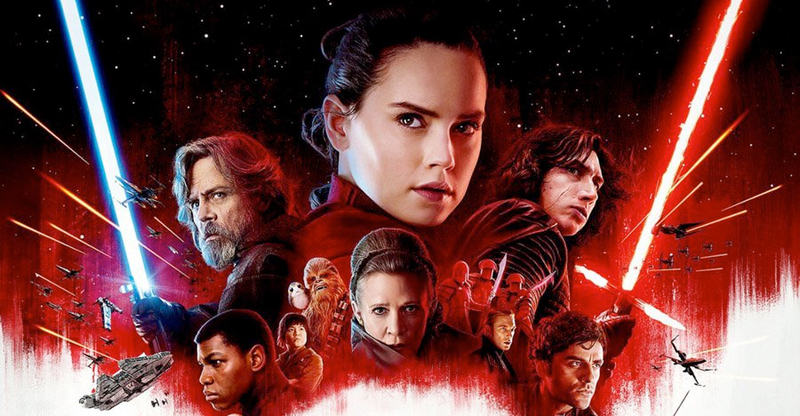 Star Wars: The Last Jedi director Rian Johnson recently opened up to CinemaBlend and explained how J.J. Abrams felt about Episode VIII's big creative swings, as well as their effects on the world introduced in The Force Awakens. 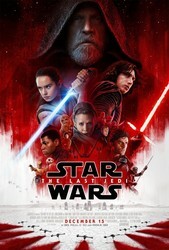 Johnson's "The Last Jedi" has been the subject of polarizing responses from "Star Wars" fans since its December 2017 release. Nah, the dude has been following me around the boards and even in conversations that don't invlove him just run in and start screaming for a source, even when its completely unnecessary. Plus, the thread is about crackpot Rey theories, so what I said didn't need evidence, as it was my theory. Perhaps I didn't make that clear. And @Holi You happen to be in the minority. Also, how do you know that its a good movie? That happens to be a rare reaponse for the film. I also read those articles, and they appear to directly contradict the evidence I had found. And here's my source for how good or not the film is. Now lets remember look at the community scores, as critic scores can rarely be trusted. Ooh, an average 4/10. That's not "good". Also, how do you know that its a good movie? It has a critic score of ~90% on rotten tomatoes and metacritic, with no negative reviews in the latter with the audience score being incredibly mixed. Ooh, an average 4/10. That's not "good". 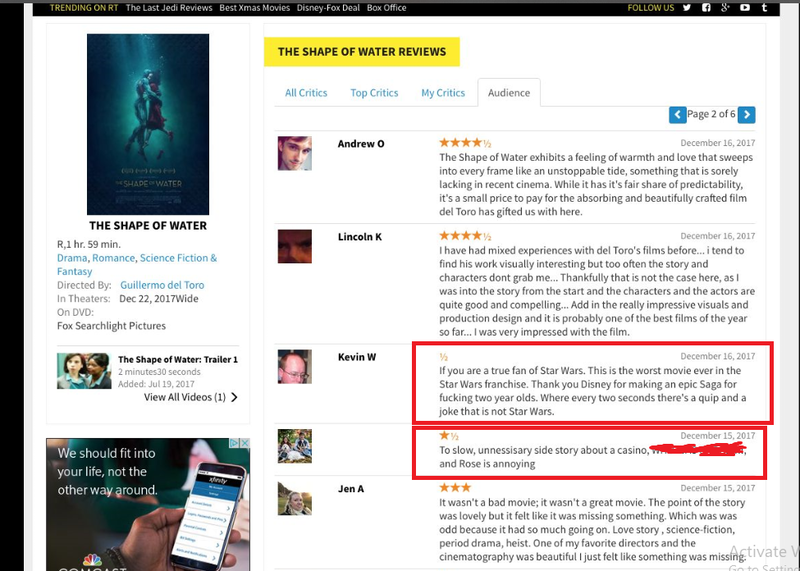 The fact that they are getting payed to review movies is why they can't be trusted. Film critic Michael Medved was paid $200 an hour to assist Paramount Pictures in defending the breach-of-contract lawsuit filed by syndicated columnist Art Buchwald, he testified Friday in Los Angeles Superior Court. @TheOnlyGuyWhoLikesMistika The heck is worng with you. I never brought you up in that comment. I was deacribing Holi's actions, not yours. Yet you are so eager to be passive aggressive.